Annie Banbury, 69, passed away June 30, 2017 in Sioux Falls. Visitation will be Wednesday July 5th, 6:00 PM at Barnett-Lewis Funeral Home with a Scripture Vigil at 7:00 PM. Mass of Christian Burial will be Thursday, July 6th, 10:30 AM at St. Mary Church with burial to follow at St. Michael Cemetery. Annie Banbury loved to phone her family and good friends, and she always left the same voice message. In a lilting voice, she would announce, â€œThis is Annie. Call me when you get home. I love you. This is Annie.â€� And we all called her back when we got home and listened as she recounted her day at LifeScape, engaged in event planning, and, if the caller was her sister and Guardian Mary, checked on her â€œFun Moneyâ€� account status. 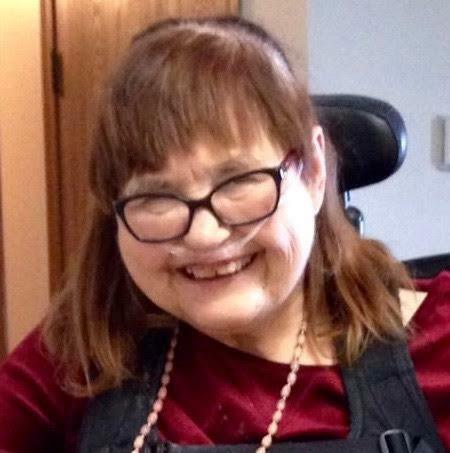 Annie had over forty years of days at South Dakota Achieve/LifeScape, living in different group homes and apartments while learning, working, and socializing at the agency. The highlight of each week at â€œworkâ€�, however, was having coffee and conversation with her beloved Service Coordinators and best friends Heidi Loof and Shannon Jones. Annie loved socializing and going to church, restaurants, shopping malls, Viking Camps, and family gatherings. She and her brother Jim attended services at St. Josephâ€™s Cathedral and Christ the King Church; in particular, Annie enjoyed the coffee and doughnuts after Mass. For the past eight years, she was a member of Celebrate Community Church, where she was a Greeter, and, yes, enjoyed the coffee and doughnuts following the service. Her favorite restaurants were Gateway Lounge and Perkins, and she celebrated every birthday at the Royal Fork; Annie was particularly enthralled with handsome waiters. Every year, she vacationed to the Mall of America and the Minnesota Vikings Training Camp. She was a member of the â€œShop till you dropâ€� contingent. And she definitely was a bona fide fan of the Minnesota Vikings, attested to by her Vikingsâ€™ hat, scarf, shirt, bag, quilt, and posters. But mostly, Annie loved being with her family. Weeks before each event, the phone calls ramped up with the same questions, â€œHow many days now?â€� â€œAm I still coming?â€� â€œAre you still coming?â€� Then we all counted down the days and provided assurances of attendance. Banbury of Louisiana and Munich, Germany; and Patrice Tunge of North Dakota; her niece: Nancy Davis; her nephews: Robert and Richard Montville; great niece: Jennifer Davis; and nephew: Eric Davis: her aunt: Rose Ann Ryan; and numerous cousins. Memorials may be directed to LifeScape Foundation (giving@LifeScapeSD.org).